Renowned for his work in SANCTUARY and NEVERMORE as well as a solo artist, in 2014 Warrel had teamed up with Brazilian musicians Johnny Moraes (guitar), Thiago Oliveira(guitar), Fabio Carito (bass) and Marcus Dotta (drums) as his touring band and ultimately this successful collaboration led to plans for a new studio album. Recordings for “Shadow Work”, the follow-up to 2008’s “Praises To The War Machine”, started in fall 2017 at Orra Meu Studio, São Paulo, and Travis Smith commenced to create the artwork following a concept and ideas previously discussed with Warrel. 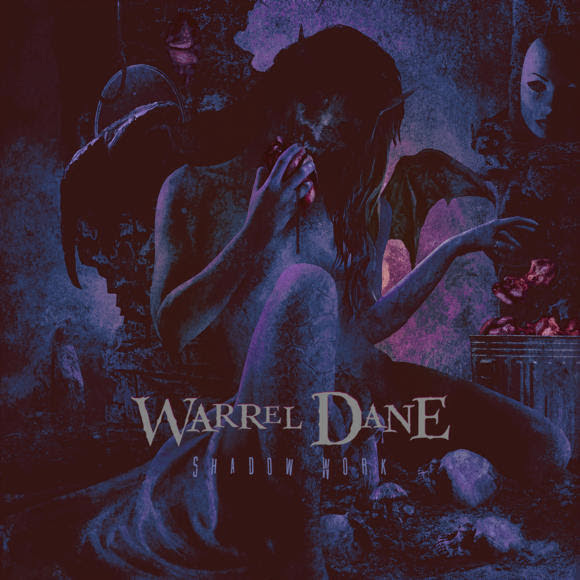 After reviewing the material that could actually be completed using vocals from various studio and pre-production sessions with Warrel, the decision was made to release his final recordings as “Shadow Work” on October 26. “Shadow Work” will be released as special edition CD mediabook offering a 44-page booklet, as gatefold LP plus CD and 12-page LP booklet and on all digital platforms. Each song is illustrated by Travis Smith‘s art, created as his personal tribute to Warrel and further explained in his personal liner notes. Furthermore, photos, lyrics and moving statements from the musicians are included as well. Smith said: “[Warrel] told me he wanted the cover for this one to be a personification of one of its songs, affectionately titled ‘Sweet Madame Satan, And Why.’ I dug up the skeleton of an old idea we’d talked about once before, and with a few details and alterations of his own, it was exactly what he had envisioned. He ‘loved it,’ approved it, and then gave me an outline for what he wanted to do for the back cover to complement it as a sort of prologue. Added Thiago, Johnny, Fabio and Marcus: “To give birth to a work like this, is for us a tribute to someone that was like family and honor his memory by sharing some of the savage poetry that he created and was ultimately so proud of. “Warrel came into our lives like a storm, took us into a very intense ride, we roamed endless roads into the unknown, into places that we never dreamed of both inside and outside our minds, and left. He was someone who lived with us, dreamed with us and enjoyed our hospitality, and in return gave us so much back. Some of us acted like his mother, some of us saw him as a father figure, some of us took care of him in some of his darkest moments. Yet he was a friend, and somehow, will be always there. A first song and pre-sales will be available from August 31.